The Black Prince was built for Vauxhall by Gordon Keeble sports cars on a new FD Venotra body in 1971 as a proof of concept. It used a 327 Chevy corvette engine (near enough 5.3 litres) 4 barrel carb high comp etc as used in the Corvette really. This was backed with a ZF 5 speed gearbox, the same type as fitted to certain Aston Martins apparently. A different final drive and limited slip diff was used, although in the stock Ventora case. A bunch of special features were added, including a Sony 4 band radio which was removable from the dash and usable as a portable radio, aux dials, Lucas Square 8 fog lights, a matt black bonnet, dash mounted ice detector, map lights and some other goodies. The Vauxhall "Griffin" badges were replaced with Gordon Keeble's tortoise logo. Rumour has it that they also built one with an automatic trans. This comes from a contemporary road test which claims that Gordon Keeble had an auto one under constrution at the time the magazine tested the manual one. However no other reliable source claims a second car was built. 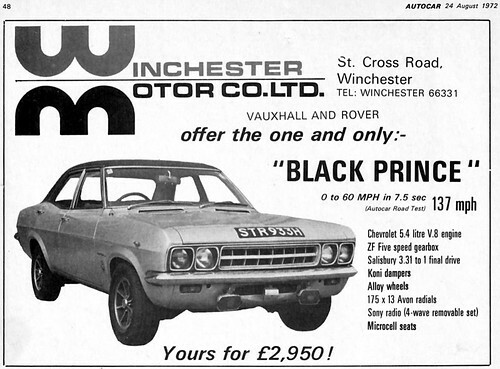 I knew a guy at Vauxhall who worked there at the time claimed the second car was called The Black Princess. I doubt Vauxhall ever intended these cars for production as why do a trial V8 car in a model which by then was already scheduled to be dropped in favour of the FE range launched in February 1972? As for the Black Prince FD. It was broken up in about 1989 by a guy who wanted to use the running gear in a Cobra kit car. Shame. He'd had it running on the road before and I spoke to the guy's nephew who remembers it doing big ol' wheelspins up the road with smoke coming off both back tyres the length of the street. I think he was the guy who bought it off the advert I assume is in this thread (pics not working for me) or maybe it was his dad who'd bought it - I forget. A Fiat Strada Cabrio so close to water! It's a first generation prototype one too, the production car was built from '83 to '85 and was based on the facelifted second-gen model. Have a look at these pictures, scanned from a 1970s UK Fiat brochure for the 124 Saloon, Estate, Special and Special T models. The 124 was a European Car Of The Year award winner, spawned beautiful coupe and gorgeous spyder derivatives, and lived on in four different countries after its death (as the Zsiguli/Lada in Russia, Premier 118E in India, SEAT 124 in Spain, and the Murat 124 in Bulgaria). But what really intrigued me about those photos when I first saw the brochure was the number plate on each of the cars. If you're outside of the UK, or not familiar with our plate system, that probably doesn't mean anything. Between 1963 and 1983 we used the letter at the end to denote the year of the car (from August to July, the letter changing on August 1st from 1967 onward). So, a plate ending in "G" denoted a car sold between August 1968 and July 1969, for example. However, some of the letters weren't used for various reasons. "Q" plates are used where the age of the vehicle cannot be determined and "O" wasn't used because it's easily confused with zero, for example. Similarly, "U" plates were never issued either. So why are those cars driving around on "U" plates? They appear to be UK specification cars, and they are definitely driving around the streets of London. I initially wondered if it was some kind of error by whoever made the plates. The cars may have been photographed in the July, say, (when the cars should have been on "T" plates perhaps) but the brochure published after the changeover so the following year letters used to keep the photos contemporary, but the plate maker not knowing that it should have been "V" not "U". Illegal, but understandable. The thing is though, the Fiat 124 was sold in the UK between 1966 and 1974, meaning that the last ones sold would have worn either "M" or "N" plates, considerably earlier than the 1978-1980 "T" to "V" plates. Weird, eh? Maybe it's just me that notices and wonders about these things. I sent a few e-mails to the FIAT UK press office about the mystery of the "U" plates, but unsurprisingly nobody seemed to either know or care much about the photos in a brochure published thirty years ago. Anybody any ideas or theories? Let me know!